I’ve been involved with the Humanitarian Toolbox allReady project for about one year now. I’ve really enjoyed being able to contribute to the cause, while learning plenty along the way. Contributing has made me a better programmer and exposed me to new libraries and techniques which I am already benefiting from in my day job and in other projects. During my time as a contributor I’ve be aware of the code-a-thons which have taken place in the US, Canada and more recently Europe. They’ve always seemed like great events and I’m excited to be signed up for the 2-day code-a-thon in London next month. A few months ago I discussed my experience with allReady and my wiliness to attend the London event with the management at my employer, Madgex Ltd. They were very receptive and were keen to support the cause. In fact, they are now funding 4 developers (including myself) to attend the full two days in London. Madgex are covering the transportation costs and hotel accommodation as well as loosing 4 developers for 2 days so this is a generous contribution. In addition to the NDC event, we had discussions about arranging a code-a-thon at our office in Brighton, one evening after work. I was really keen to get something planned in and allow other developers to be able to contribute and experience allReady. With the concept green lighted by senior management, we set about making the idea a reality. The starting point was to arrange a 30 minute presentation about Humanitarian Toolbox and allReady to gauge interest and demonstrate the application. I prepared a set of slides and a short demo which I presented in our board room one lunchtime. We had a good turnout of about 16 people in the room and it planted the seed with a few of the attendees, who talked to me afterwards about getting involved. With a week to go we started to ramp up our planning activities. 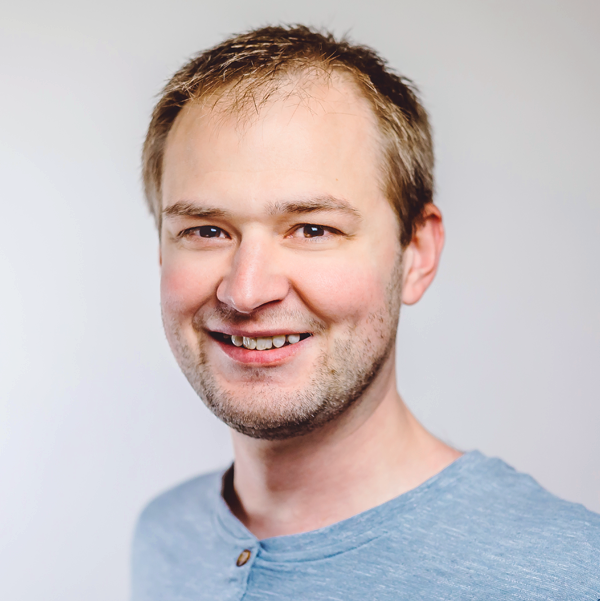 Steve (developer lead), helped with the physical space we needed and secured budget for some pizzas on the night (always a great lure for developers!). I started combing through issues on GitHub that would be suitable for new contributors. We have a lot of work on-going with the project, pushing towards our v1 release but many of the issues that are left are quite complex and require a reasonable knowledge of the codebase. The balance was finding interesting and diverse issues, whilst ensuring that they wouldn’t require too much time up-front having to learn about the entire application. I had decided to try the new project feature inside GitHub to plan and organize the event. I created a few statuses and dropped issues into the “Not Started” category. The project feature is a basic Kanban board which allows cards to be dragged between statuses as the work progresses. I also put together a pre-requisites list for the confirmed and tentative attendees, guiding them to ensure they had the latest tooling for .NET core installed, had forked and cloned the repository and were able to get it building. This is an important activity since it’s a little time consuming and we didn’t want to spend most of the time at the code-a-thon performing the setup work. As the big day approached we started to firm up numbers so we knew what cabling infrastructure we would need. On the morning of the event, I did a final round up of the staff to confirm final attendees. After completing this we had about 6 locally able to attend as well as one of our developers from our North American office in Toronto, Canada. I started collecting GitHub usernames so that we could add people as contributors on the repository. This isn’t absolutely required, but aids in assigning issues to specific people. We also arranged to get people added to the Humanitarian Toolbox Slack channel so they could ask questions from our project experts and the Humanitarian Toolbox founders during the event. At 4:30pm (with 30 mins to go) I moved into the meeting room we would be using for the evening. I wanted to get the webcam setup and ensure we had the cables for power and networking. Our fantastic systems technician Ricky had beaten me to it and already sorted the cabling requirements. We tested out the remote Skype link to Luke in Canada and made sure we had everything ready. A big thanks to Ricky for volunteering his time to provide some tech support and make sure we got up an running so smoothly. 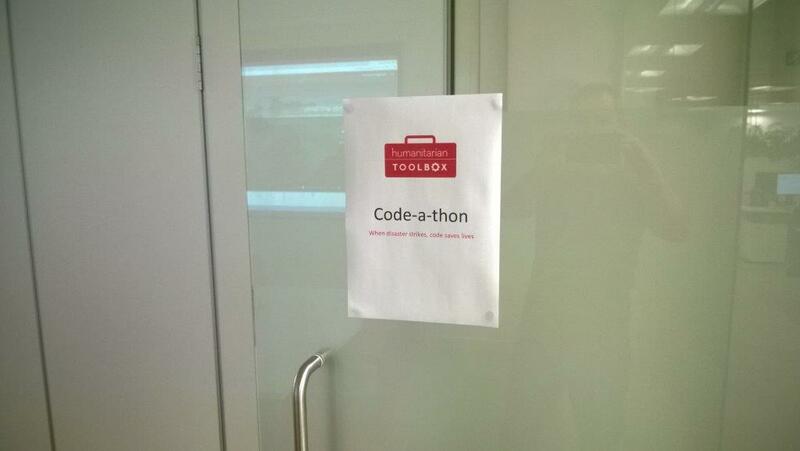 You must have a nice sign when running a code-a-thon! 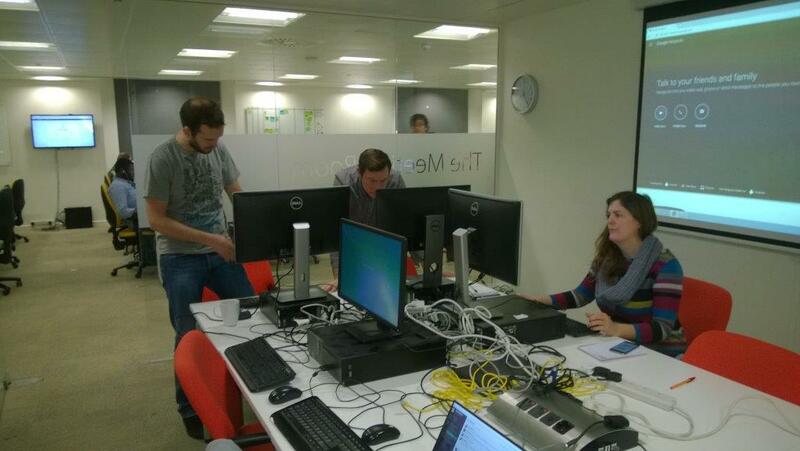 At 5pm our team of developers migrated like birds in the winter, to the meeting room. 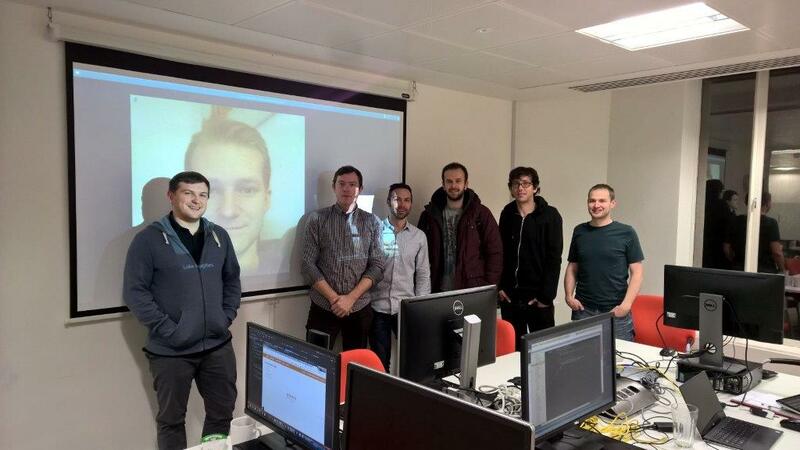 We had 5 developers joining me locally, plus Luke video conferencing with us from across the pond. We’d decided to relocate our desktop PCs into this common area so that it would be easier to support each other during the event. While this required a little time up-front to disconnect and reconnect the PCs, it proved a good move as I was able to answer questions, share information and demo things very easily for everyone. By about 5:20pm we were in good shape, the computers were moved, developers were settled, pizza orders had been taken (priorities people). We started with a brief Google Hangouts standup with the Humanitarian Toolbox team. James and Tony introduced the project, it’s goals and thanked everyone for taking the time at the end of their working day to stay on and code for the greater good. We also had one of the most regular project contributors Mike on the call, showing his support for the event. Being able to speak to the founders and project team made for a great start and really set the tone for a fun evening, supporting code to save lives. It’s worth pointing out here a couple of things that James and Tony highlighted during the standup. Firstly, the initial use case for the application will be to aid the American Red Cross with the effort to install free smoke alarms in people’s homes. Already this initiative has helped save lives when disaster struck and a family’s home caught fire. Thanks to a smoke alarm installed by the Red Cross, the family were alerted to the fire and all able to evacuate safely. Also important to note is that for each hour of coding time spent on the application we can expect about 40 hours of volunteer time saved. That’s a huge return and really shows that even sparing a few hours of personal time can have a massive impact. With the project introduced and the devs eager to get going we started the team off by finding issues people were keen to work on. Sarah, Roberto and Luke took on some unit tests, Patrick picked up a new feature requirement, while Chris dove in with some EF and migrations code for the first time. Mark one of our front end developers started looking at the homepage UI improvements. I floated around the room to answer questions, demonstrate the site functionality and to help with the GitHub flow. 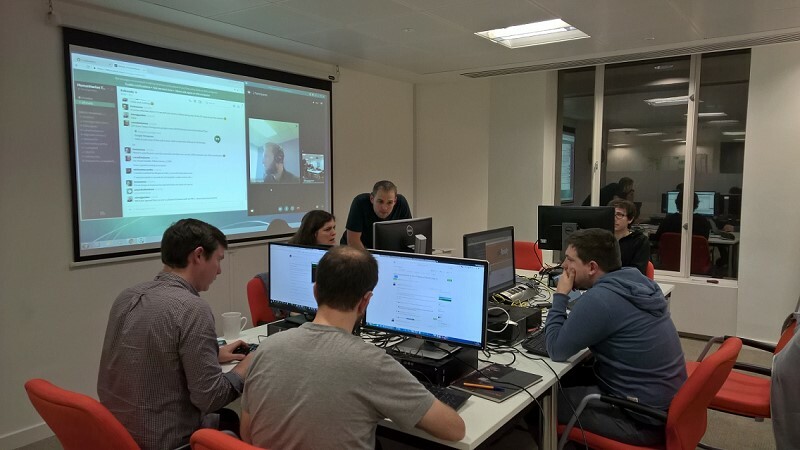 I really enjoyed watching new contributors getting up to speed with the code and being able to assist their learning as they progressed. It was good to be able to witness some of the common questions new contributors have so we can focus on lowering the barrier to entry in the future. There were a lot of new things for everyone to learn and they did a fantastic job of absorbing the information and becoming productive quickly. All of the developers were new to GitHub and OpenSource, so there was learning to be done around the processes to ensure an up-to-date master branch, to manage rebasing and prepare pull requests. Most of the team were also experiencing ASP.NET Core for the first time, which in itself has a lot of new concepts to learn. It was also the first exposure to Entity Framework for everyone, so that had it’s own learning curve too. This really highlights another benefit of contributing to the project for developers. It’s a great learning experience that puts a real-world, production-ready code base in the hands of developers. During the 3 hours everyone knuckled down and other than a brief break to load up our plates with some pizza, we worked solidly. I had hoped to use the GitHub project feature to keep track of things, but we hit some issues with people not being able to move the cards themselves. While I was able to do this, it proved more of a hindrance as my time was better spent helping people around the room. In the end we abandoned that feature and in hindsight a post-it-note board might have been easier to manage. I still like the concept of using GitHub so that others not physically at the event can monitor progress, but we need to find a way to allow contributors to manage the cards as they work on issues. I suspect it might just be a permissions thing, so I’ll investigate it soon. By the end of the evening we had submitted two pull requests which were reviewed and merged into the project before we left. We also had three other issues very close to being completed which will be finished off in the coming days and hopefully submitted soon. Given the setup time, huge learning curve and relatively short coding period of three hours, I’m very pleased with this achievement. Everyone was amazed when we realised that we had hit the 8pm finish already. Time flew, which is a great sign and from feedback so far, people would have liked to have even longer with the code. Perhaps an all day event ison the cards for the future. I really hope that everyone left feeling as positive and happy as I did. 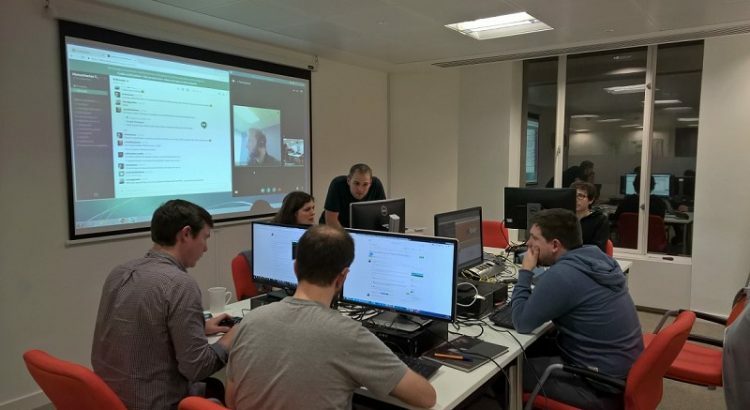 Certainly the sense I got was that everyone enjoyed learning some new things, getting to grips with the code and contributing to a good cause. I feel proud to be part of such a generous team of people who were able to join this code-a-thon after a full day of development at work first. Everyone should be very proud of what they managed to contribute. I’d love to run another session to continue the great start we’ve made and if people are willing, perhaps we can make it a regular thing or even look at a longer full day event. From a personal perspective I enjoyed sharing what I’d learned during my time with the project and seeing other developers pick up the concepts for themselves. Prior to this, I’ve never been too keen on the idea of being a “teacher” and even presenting is not in my normal comfort zone, but I found a bit of a passion for instructing people. I’m a firm believer that by sharing information, it helps our own understanding as you are challenged to know enough to be able to articulate the concepts. The feedback the day after has been extremely positive. I’m very happy to hear that people enjoyed themselves and had a positive and fun experience. It’s nice to spend time coding for fun, outside of the normal day-to-day work. Being able to put your skills to use towards such a positive concept is also very rewarding. From a quick survey afterwards, the team are keen to continue to contribute to the project and would like to take part in another code-a-thon in the future.